Highway 441 was still closed due to the big storm and the late Spring snowfall. Our next stop was Asheville, NC so to get there we had to drive a bit north and cross the Great Smoky Mountains National Park at a lower elevation. This was probably just as well. I am not sure about pulling a trailer over the top of the mountains. It was a lovely day for a drive and you couldn’t beat the scenery. We were staying at the Campfire Lodgings RV Park which was just outside Weaverville and a few miles north of Asheville. The campground is situated high on a mountain with an outstanding view of the valley below. A river runs through the valley and it couldn’t be much more beautiful. The road leading up the mountain was a bit treacherous. As with so many of our arrivals, it was perhaps more excitement than we needed. The steep incline twisted and turned and, for the millionth time, I wondered how a Class A would ever make it. This concern was echoed as Jim worked to back in to our site. The ground across the road dropped off precipitously and it was quite a trick to jockey the trailer into the site. We got settled and enjoyed a quiet evening in camp. The caretaker at the campground was an extremely friendly and gregarious young fellow. He was very helpful. We would see him frequently during the next two days. He was obviously a devout Christian. I say obviously because his t-shirts invariably had a religious message. His standard farewell was, “Have a Blessed Day.” It was a little awkward for two reasons. The first was that we wanted to be cordial, but we were uncomfortable responding in kind. We solved that by saying, “Thank you, and you, too.” The other reason was we had begun watching The Handmaid’s Tale and it was frighteningly reminiscent of that disturbing dystopia. Having had such a glorious hike in Elkmont, we were anxious to get back on the trail again. If I had thought Ashville would give us easy access to the eastern side of the Great Smoky Mountains as well as a neat town to explore, I was a little misguided. The National Park was a distance away. Not insurmountable, but farther than we wanted to drive round trip for a hike. After a bit of research, we decided to hike the Craven Gap Trail. It was only half an hour away and had some decent reviews. The GPS took us on a wild ride to the trail. We drove up Webb Cove Road, a twisty-turny adventure ride up the side of a mountain. I have no idea how people drive this road in the dark or inclement weather. It was a white knuckle drive for me. Sadly, a bologna sandwich is just not that satisfying after dining on pate. The trail was fine, but it was nothing close to the glorious Cucumber Gap Trail. We hiked for a good long while through the woods. Trees obscured the views of mountains and ridges. We stopped for lunch at the turnaround point and hiked back. We spent the balance of the afternoon at the trailer. After all of our tick adventures, I had made another vet appointment for Dakota to get a Lyme test. There was no way I was taking my beautiful puppy to the vet in his current dirty condition. Since the shower plumbing was leaking I finally decided to wash him in the shower using buckets of water. As always Dakota was patient with the strange behavior of his human. He patiently stood and waited as I hauled buckets of water to we him, soaped him all over and then hauled more water to rinse him. Once it was over, it was easy to see how happy he was to be clean and even more beautiful than before. When we had woken that morning, we saw the site next to us was now occupied. Late the night before a somewhat dubious looking trailer and red pickup truck had arrived. I am ashamed to say we were a bit sniffy about it. We would never get to a campground late at night. We disparaged their ancient trailer and truck. We were not very nice. Of course, we met the occupants and they were completely charming. They were two women in their late 20’s, early 30’s. They were taking a year off to travel the country. One had sold her house and together they had bought the old trailer and ripped it apart and re-built it. They gave us a tour of their 23’ trailer and the job they had done. I couldn’t have re-wired a trailer, ripped out the shower or built a platform bed. They had done a lot of work on the old pickup, too. In fact, they arrived so late because something had happened to the brake pads. I could not begin to fix brake pads. These women had moxie. They were having a grand time and we shared our respective plans and adventures. 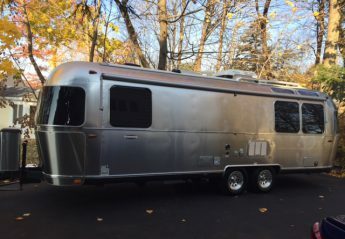 One of them asked if I had read The Longest Road—about a man with an Airstream. I said I hadn’t and she offered to lend it to me. The book is by Philip Caputo and it turns out he lives in Norfolk right near us in CT. He decides to drive from Key West to the Arctic Circle and does so in an old vintage Airstream. I returned the book to them when we left and downloaded it to my Kindle so I could finish it. Not unlike Travels With Charley, the similarities in our experiences were striking. Our second day in Ashville was dedicated to a walking tour of the city. Touristing with a dog means walking tours so we hit the Visitors Center first and got a map. It was a sunny day and perfect for sightseeing. We strolled around. Having been beautified, Dakota garnered much attention and pats. I was excited to visit Malaprops. It had been many years since I visited this independent. It was satisfying to poke around the bookshelves. We stumbled upon Pete’s Pies. They touted their dog-friendly courtyard dining area and that was enough for us. It was a very delightful courtyard. I ordered a Ploughman’s Special. It was enormous. Dakota helped me with the apple slices and I had enough to take with for a lunch again the next day. Jim had a Shepherd’s Pie. We had a vet appointment up in Weaverville at 1:30 so we hustled back to the truck. The Appalachian Animal Hospital had good ratings on-line. The building which housed the clinic looked brand new. I walked in with Dakota and was ushered to a small room. It was nice not to have to deal with other animals. After a brief wait, a technician came in and asked why we were there. She was in her 20’s and very friendly. She had another young woman with her who was interning at the clinic. The vet came in and rather than look at Dakota on an exam table, joined him on the floor. She gave him a thorough check up. At one point Dakota was a little nippy and they got him a “party hat.” It was a very simple nylon muzzle with a velcro close. He didn’t seem to mind it at all. I love that they made it a positive experience. How could we mind a “party hat?” They drew blood for the tests which happily came back negative. Dr. Sheldon gave Dakota a clean bill of health especially for a dog his age. It was once again a relief to know that our lifestyle of traveling and hiking, changing venue often was not having an adverse affect on Dakota’s health. In fact he had lost yet more weight and was now down to 26.5 lbs. That was just about three pounds of lost weight. I sure wish I had dropped 10% of my body weight on our trip. We had one last night in Asheville. We enjoyed a fire in our fire ring and savored the lovely night air. The visit was too short, but we had enjoyed it.